The Halloween festivities can be fun to enjoy with your furry friend, but keep in mind that all of the excitement might be a little scary – especially to your smaller dog. Here are some things to keep in mind as you prep for the spooky season to keep your pup safe and feeling comfortable! If your pets spend a lot of time outdoors or hanging in the window, it’s probably best to start keeping them inside or away from the sights outside for a majority of the day a few days before (and maybe a few days after) Halloween. You don’t want your pup to frighten the kids trick-or-treating in your neighborhood, nor do you want those kids dressed in their strange costumes to frighten your pup! Keep your pup in a different room away from the front door that will be constantly opening and closing all night as you dish out the candy for your visitors. Make sure that you also check that their tags are secure, as if they do get spooked and bolt through an open door, you want to be sure that your contact information is clear in case a neighbor or passer-by finds him or her. 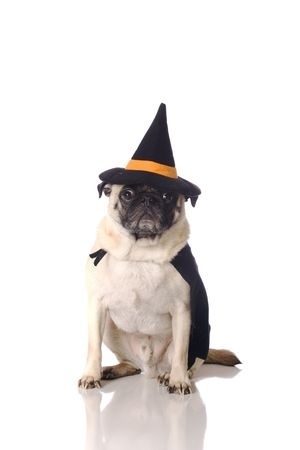 Dog costumes can be super cute, but if wearing one really distresses your pup, consider skipping it. A few adorable pictures isn’t really worth your pup’s misery. Plus, an irritated dog could act aggressively or run away – scares you don’t want this holiday! While you’re handing out candy, make sure you keep the bowl out of your pup’s reach. Chocolate is really not good for your pup, and just a little bit can cause serious tummy problems. Signs of chocolate poisoning including vomiting, diarrhea, seizures, rapid heart rate and rapid breathing, says PetMD. Get your pup to a vet immediately if you notice any of these symptoms and suspect he may have had some chocolate. Be careful with your decorative pumpkins – carved or not – since eating them could also cause tummy problems for your pup. Plus, if you have lit candles inside, keep an eye on the flame and your dog. If he or she knocks over a pumpkin with a lit candle, that could cause a big problem! Keep these tips in mind and have a safe and fun Halloween season with your furry friend!